You might want to sit down for this, because we have an amazing Ink Fridays™ deal in store for you that's practically free. 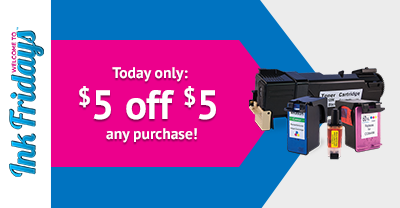 Here it is: $5 off any $5+ ink or toner cartridge order! Your inner bargain hunter will definitely enjoy this offer, because if your order is $5 or less, you don't have to pay a penny except for shipping. 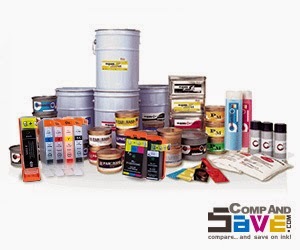 So from compatible ink and toner cartridges of all popular brands, the possibilities to save on are endless. 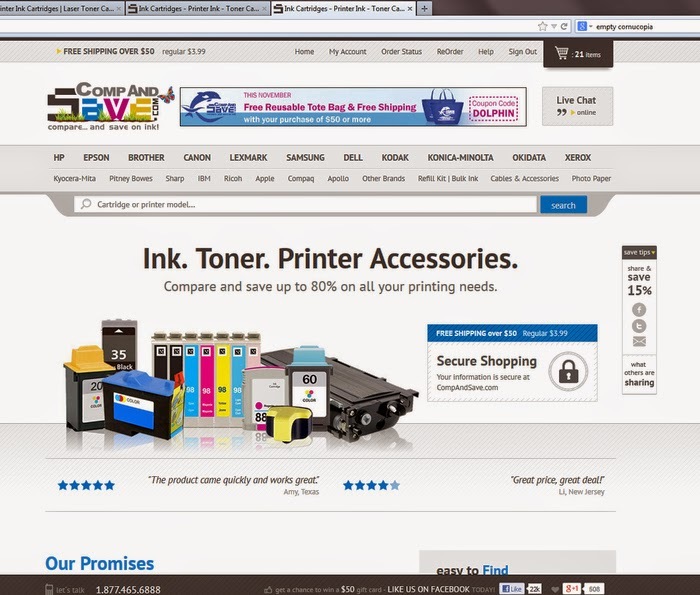 We enjoy providing this fun discount deals, you can start saving $5 off any $50 or more printer cartridge purchase here. Remember our Ink Fridays™ deals expire every Friday, and this week this mad deal ends on March 20th at 11:59 PM (PST). We enjoy sharing printer cartridge deals like this week's to our shoppers and readers. After all, this is why we created Ink Fridays™. We hope you enjoy the savings! If you don't want to miss next week's deal, you may always check back to this blog or receive an update in your inbox by joining our mailing list. Remember, you can still save $5 off any $5 or more printer cartridge order before March 20th at midnight (PST). Drawing with 3D pens is a little like creating things out of thin air, isn't it? You glide your hand and out appears your drawing just as you imagined. In fact, the most popular 3D print pen, "3D Doodler", has a tagline that pretty much sums how it works: "It's a pen that can draw in the air! Lift your imagination off the page!". As Wired.com put it once, the "3D Doodler is for “anyone with a passion for making”. You may be asking yourself how these magical-like pens work, and we're to help clear that up. 3D pens use the same type of filamet, often plastic, arranged into a spool of moldable thread that melts to create 3D objects that regular 3D printers do. Given that this technology is already available, and is constantly being improved upon, how likely is it that 3d pens such as these and others like it will become staples for the home and office in the near future? 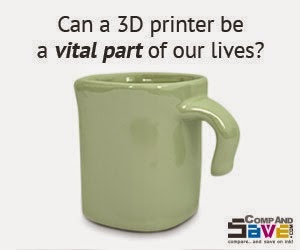 We explore this idea in today's blog topic, find out the answer with us below. 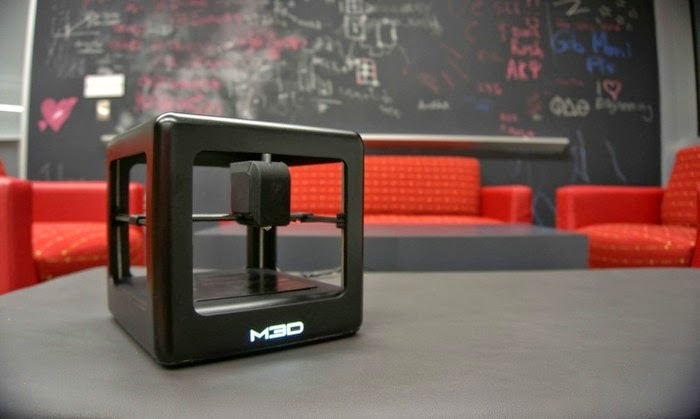 3D printers tend to be popular with designers, makers and hobbyists. Thing is, these are usually large and bulky devices that - especially when you compare them to 3D pens. That said, with 3D pens This is literally something you slip into your pocket and whip out at a moment's notice. So anytime the creative bug bites and you want to ‘draw’ something - a 3D pen is a easy and portable choice. It's no wonder that 3D pens have captured many's attention. Even WobbleWorks LLC., a major toy company, has joined in the 3D pen fever and began a Kickstarter fundraiser project on March 25, 2013 with a small goal of $30,000. This number was met in a matter of hours. In fact, the 3D Doodler Kickstarter program raised well over $2 million! And why not – this device is as close to being a magic wand that we can get to! The Samto 3D Stereoscopic Printing Pen Grey for 3D Drawing Doodling is another option for artists, hobby enthusiasts, and other creative individuals. The 3D stereoscopic printing pen works on pretty much the same as the 3D Doodler. It melts plastic filament to let the user create different objects. This is defiantly a cheaper option at $70, but take it with a grain of salt - this one has mixed reviews. As always, it's best to check reviews before making a purchase. The 7TECH 3D Printing Pen with LCD Screen is a similar device also priced around $100. This 3D printing pen claims to prevent clogging and jamming for a trouble-free user experience. There's not too many reviews, but they are quite positive and mention that it's light to use compared to other 3D printing pens. Scribbler 3d Printing Drawing Pen with Filament is another similar product with largely positive buyer reviews who claim it's "cool to the touch" and easy to use. The pen comes in 4 different colors for those of you who like owning a specific color of technology. We shall soon see the 3D Doodler 2.2, a lighter, slimmer, sleeker version of the original. This will be something quite like a regular marker and will be hitting stores later this year. According to WobbleWorks, about 130,000 3Doodlers have already been sold and the company has raised another $1.5 million to bring us the 2.0! 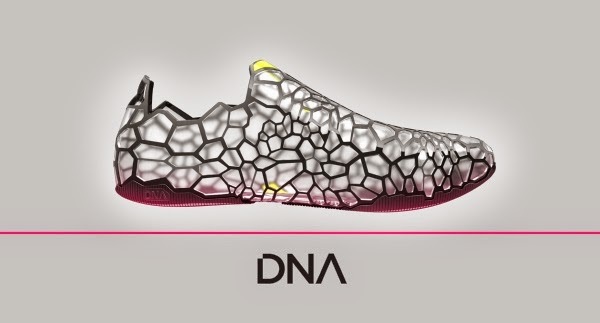 This new version was unveiled at the International Consumer Electronics Show in January of this year. If you're interested, you can pre-order this from the 3D Doodler store and even get inspiration from the Doodler community in the form of videos, stencils and other creative ideas. Another new option is the CreoPop 3D pen, the world’s first 3d pen that uses cool (and not melted) ‘ink’ - or so they claim. Also, several features such as glow in the dark inks, aromatic inks and inks that change color with temperature will make this even more attractive for kids.This is a child-safe option that uses resin and not melted plastic filament, which is a great feature to have to make 3D drawing hazard-free for kids. After all, how many times do you see kids copy their parents? 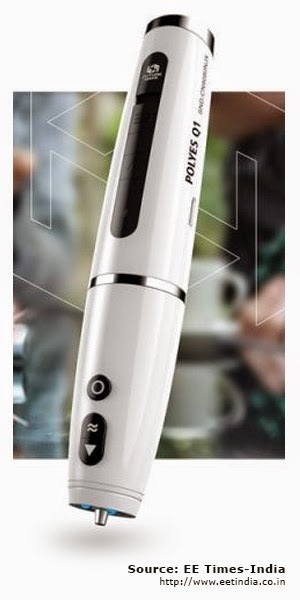 Polyes Q1 is a 3D pen that also uses cool-to-the-touch technology. One new feature is that it's the first to use blue light and multi-functional inks. For example, with these multi-functional "inks", you can make lollipops, Christmas trees, and windmills! Talk about endless possibilities. It's no wonder this Kickstarter project has raised more than 3 times it's original amount. The Lix Pen claims to be the smallest 3D printing pen in the world. Also a Kickstarter project, it has more than 8,000 supporters who have pledged well over 700,000 for a $30,000 project funding goal. So,how soon will you have a 3D pen in your hands? Do you think this is going to become a common object around homes and offices? We certainly think so, given the huge amounts of interest and funding these projects attract. Stay tuned via our newsletter, our Facebook or Twitter pages to know more about printing innovations and to find the best deals for printing on your current printers. There’s nothing scary about this Ink Fridays™ deal for Friday the 13th! 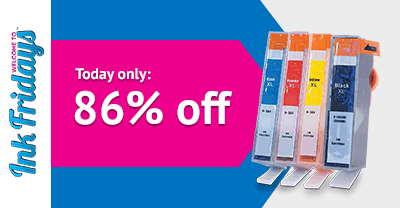 Our special offer of the week is better than BOGO: Buy 1, Get 2 FREE HP 564XL Replacement (Pack of 4) High Yield Ink Cartridges. 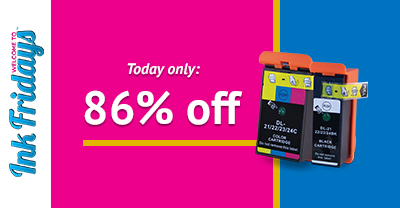 At a price of $21.80 for 12 HP 564XL replacement ink cartridges , this means you are buying each for only $1.82! That’s quite a steal with 86% in savings, especially considering retail value is $161.94. As always, we enjoy sharing exclusive deals with our amazing readers, this offer runs only on this Freaky Friday of March 13th, 2015 until midnight (PST). Fight off the 13th with this lucky deal here. You may view the complete list here at our website. Sign Up for Sweet Offers Every Friday! As always, we have a sweet offer waiting for your every week with Ink Fridays™. Offers can be anything like today's "Buy 1, Get 2 Free" to a great photo paper deal. If you don't see what you're looking for this week, you'll be sure to find it soon enough. You can sign up for our Ink Fridays™ mailing list to get a friendly weekly reminder about what we're offering. 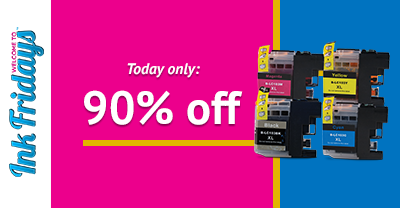 Reminder, it's still not too late to save over 86% on HP564XL replacement (4-pack) high yield ink cartridges! Check out our Freaky Friday offer here.